This special, morning-long session features a series of speakers aiming to illuminate under-recognized or under-reported facets of the challenges of providing equitable opportunities for all students. Topics examined include social mobility, cultural questions, combatting trauma, and solutions focusing on equity. There’s a perfect storm of poor conditions fueling America’s troubling achievement gap. Six of the country’s top thinkers on equity in education recently laid out some of the reasons why poor students of color struggle academically. And it’s not just because of what happens inside of classrooms. 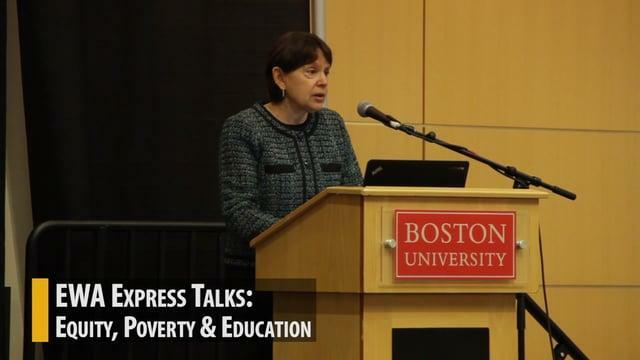 “The gaps (when students enter school) account for the majority of the gaps later on,” said Jane Waldfogel, a professor at Columbia University who participated in an Education Writers Association discussion this month on equity, poverty, and education. In researching his book There Are No Children Here: The Story of Two Boys Growing Up in the Other America, journalist Alex Kotlowitz met with his two young subjects each week for pizza. He wanted to know about Lafeyette and Pharoah’s world in one of Chicago’s poorest neighborhoods. In the beginning, he would ask about gangs, violence, shooting and drugs. All Lafeyette and Pharoah wanted to talk about was the spelling bee at school.